This column addresses some miscellany. 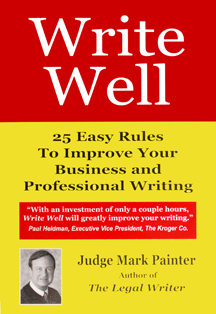 Long-time readers will note that the references to the “rules” refer to those in The Legal Writer 2nd Ed. 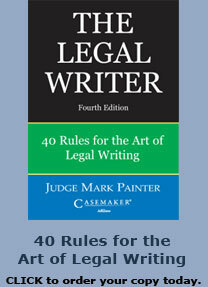 : 40 Rules for the Art of Legal Writing. These were discussed in detail in previous columns. If you missed the earlier installments, there is info on how to buy the book at the end of this installment. Did someone ban contractions from legal writing? Is there a rule against apostrophes? Did we learn that one right after the rule against perpetuities? (An apostrophe in being, plus …) Writing is it not likely instead of isn’t it likely just sounds stuffy. If you prefer cannot for can’t, I won’t argue, but generally use the contraction if it sounds natural. And yes, sometimes the formal can supply slightly more emphasis. Write with your ear, as well as your eye and your brain. The apostrophe is unjustly maligned. Avoiding apostrophes results in clumsy constructions. It also adds to the word count, by adding clutter. The apostrophe is a useful tool. Use it. In addition to contractions, some writers seem to think possessives are banned. Lawyers write the docket of the court instead of the court’s docket (see Rule 23 – Always Question “Of”). Use the possessive with the apostrophe, not the longer and more pompous of construction. The general rule is to spell out numbers one through ten. You should then use numerals for 11 and above. Some authorities do have different rules. For example, The Chicago Manual of Style (15th ed. 2003), favors spelling out numbers up to one hundred. But Bryan Garner’s Modern American Usage (2003) specifies the one-to-ten rule, as does his Dictionary of Modern Legal Usage (2nd ed. 1995). That rule is better for legal writing. Another hint: leave out the double zeros after a decimal. Write $200, not $200.00. And substitute words for rows of zeros where possible. Write $2 million, $5 billion. For percentages, use the percent sign (%). And remember Rule 6 – No Parenthetical Numericals. Never clutter your document with both words and numbers: “There were four (4) plaintiffs and six (6) defendants.” Never. Does that convey any meaning at all? Of course not – it’s just legal nonsense. But we litter our legal documents and pleadings with it. Delete it. Just write “Jones moves for summary judgment.” Unless, of course, the honor of the court is actually in question. What does that mean? I always think I am going to get a present. This nonsense is on all of my certificates of election. These quaint documents are a veritable litany of banned words: know ye, aforesaid, said, in witness whereof, and even in pursuance of, which is even worse than pursuant to. Gosh. 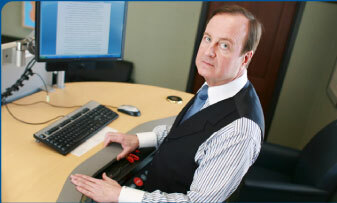 Lawyers and judges use too many dates (See Rule 5 – Avoid Overchronicling – Most Dates Are Clutter). Using an exact date signals that it is important – that the reader should remember it for future reference. If that’s not your intention, strike it out. You can convey continuity and order by clues like next and later. Or use “in June,” then “in July” to show chronological order. In referring to decades, do not use an apostrophe – “during the 1980s” not “1980’s.” Technically, either is acceptable; but the modern rule, which produces cleaner looking text, is to leave out the apostrophe. Last month I received an email with this question: Where do you use supra and infra? My short answer is – nowhere. Nor should you use op. cit. or loc. cit. These cross-reference indicators are distracting and unnecessary in most legal writing. They abound in law reviews, so new lawyers tend to believe they are acceptable, even desirable. If you want your brief or memo to be just as unreadable – and unread – as most law reviews, then litter it with supras and infras. When you use an infra, you are saying to the reader “I’m going to tell you about this later.” That’s just silly – if something is relevant now, talk about it now, not later. Footnotes are for citation only (See Rule 13 – Citations Go in Footnotes). So any supra or infra would automatically be in a footnote. But instead of using a supra to indicate you have cited something just a footnote or two earlier (if it is in the last footnote, it would be Id. ), it’s more convenient for the reader if you just repeat the cite.